Digital signage is one of the highest growth segments in audio visual and IT. What began as an advertising medium focused on the retail market now permeates corporate, healthcare, financial and many other segments. Our new guide “RFP Template: Digital Signage” provides a solid overview of the technology options and business applications of digital signage. 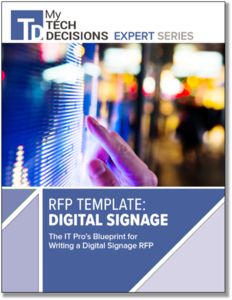 It also covers the essential questions you need to ask when writing a digital signage request for proposal (RFP). Download our guide today to get a leg up on your next digital signage project.